Anti-nuke activists are celebrating another announced nuclear power plant closing. 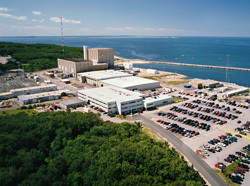 The closing of the Pilgrim nuclear power plant, near Boston, will result in the loss of over half of the plant’s work force of 600 when the plant is shuttered in June 2019. But to young activist Anna Baker, chairwoman of the Pilgrim Coalition, “the hard work is really just beginning”. Really?! Hard work for whom?! The plant simply couldn’t compete economically with its competition, cheap & abundant natural gas. Sorry Anna, the plant’s closing had nothing to do with the “hard work” you and your cohorts have done since your group’s inception four years ago. And what hard work will your organization and other anti-Pilgrim organizations do now that the plant is closing?! Seems like it should be time for all these groups to cease and desist or find another target for their aggression. It is quite incredible that the NRC has still not addressed decommissioning requirements for all those plants that are already well into the process. And for those soon to be entering the process. This however is just the way the NRC operates. A half- century of licensing & operating nuclesr plants with no permanent off- site repository in place for all the high level waste that is piling up at 90 reactors sites all over the US, many in the backyard of large metropolitan areas. The word gross negligence comes to mind! With all these premature shutdowns dedicated utility professionals are losing their jobs. How many NRC personnel have or will be losing their jobs? This is what the inspectors and the NRC was trying to hide from you in 2015002. This is what Entergy was alluding to in their 2010 LAR at the top of the page. This below set of documents represents the disastrous decade (Target Rock) from 2000 to 2009 with the 2 stage SRVs. These “reliability problems” drove Pilgrim to the tragic 3 stage problems. As for the arc of SRVs problems in these BWRs, the first “new” operating 18 month period with the 3 stage SRVs consisted of a host leaks and a premature expensive shutdown do to a leaking SRV. Then in the outage they discovered three failed 3 stage SRVs in lift testing. Engineering wise, the arch of history, you knew the so called new era of the 3 stage SRVs was going to end up in a spectacular high speed car crash careening into a concrete wall. Post 2 stage era (we thought), within weeks of first start-up with the so called new 3 stage SRVs, barely before the SRVs were heated up, the plant had their first leak with the new 3 stage SRVs. I knew from that little leak the car was heading for the big crash at the concrete wall and going to disrupt the lives of many people. The arc of history in BWRs with SRV valves is fascinating. This is my example where systemically everyone accommodates poor designs of components in nuclear power plants. We are running around in a circle of poorly designed SRV models like a mad man off his medications. It is not the disciple to fix it right the first time mentality. We started out with the disastrous 3 stage model or design in the 1970s. The fix was 2 stage design. Everyone now has had burdensome problems with the 2 stage in which they can no longer tolerate. They are all running “back to past (Back To the Future)” to our 3 stage SRV failures of the 1970s. Honestly, this tremendously burdens (screws them) the control room operators the most and also the resident inspectors. It screws mostly the rather low level and highly skilled and trained technical people with the least power to do the right thing. I’ll make the case this kind of valve destroyed TMI (pwr). The following corrective actions are planned. Engineering is working with industry representatives to evaluate actions and potential modifications to reduce or mitigate set-point drift. In the January 2004 timeframe, the discharge pipe temperature of relief valves RV-203-3A (pilot serial number 1054) and RV-203-3D (pilot serial number 1049) increased, indicating pilot valve leakage. Pilgrim Station initiated and completed a planned shutdown on March 22, 2004. The purpose of the shutdown was to replace the pilot valves of RV-203-3A and -3D and other planned maintenance. A review was conducted of Pilgrim Station LERs. The review focused on relief valve test related LERs that were submitted since 1984. The review identified LER 91-014-01, LER 93-011-00, and LER 99-004-00. It is as if you detected brake problems in your car. You go to your local dealer explaining your concerns. He puzzling asked to see your owner’s manual. He quickly thumbs through the pamphlet. He says your car is perfectly safe. It meets all the state and federal safety requirements. He doesn’t take the car for a test drive or check the pads on your brakes. So I think this is basically NRC engineering negligence and a cover-up. I like IR 2015002 and have carefully considered it. It is my opinion what the NRC is saying in that report; the valves meet all the licensing and tech specs. The 3 stage did also right to the end. The inspectors in that report never shows any indications they looked over the industry and Pilgrim’s 2 stage operational and problems history what-so-ever. The NRC in any of this never indicates they evaluated the operational problems with these 2 stage. It’s like the NRC just doesn’t care about the 2 stage troublesome operating history. Many plants are trying to jump out of the troublesome 2 stage right at this moment and into the 3 stage. What it looks like is the agency picks and chooses what positive information it disclosed to the community in order to support the dangerous agenda of the licensee. It hides the information that is derogatory to the agenda of licensee. The NRC carefully references all the documents the inspectors looked at in IR 2015002 in the back section. You got a list of 15 pages on Entergy’s documents the inspectors look over in the inspection and many of the list contain more than one document. It is specious as heck the proposed March 15, 2011 LAR with the derogatory operational historical “reliability problems isn’t reference in the inspection report back page references. Not a word about reliability problems identified by Entergy in the 2010 document? Why does the NRC only list the partial 2011 LAR material…not the derogatory historical information? We can hear the NRC now if operational problems begin to show up on the 2 stage…we had no evidence of 2 stage historical reliability problems because we never read the description section in the 201O LAR not described in the IR 2015002. We certainly got our rear ends covered in the wording game. So this is what is in the IR back section. Nothing about 2 stage historical operational problems. This would be my example where the NRC systematically cherry picks public information disclosure only favorable to the licensee’s agenda. They withhold derogatory descriptive historical information and exaggerated the value of limited licensing and tech spec information. The agency is continuing on with the word games that got us the 3 stage problem. Hope Creek is an interesting Feb 2015 example. They have fourteen SRVs. They have eleven 2 stage (7567F) and they are experimenting with three 3 stage like Pilgrim’s failed SRV. Ninety one percent of the 2 stage failed technical specification testing and required immediate shutdown. There was no similar failures in the 3 stage. •	The Safety Relief Valves (SRVs) installed as replacements at Pilgrim are spare Target Rock 2-stage SRVs. •	These spare valves were completely refurbished and tested in accordance with current practices, with vendor-recommended improvements, both in testing configuration and assembly with respect to torque values. We review plant documents but we do not retain them once the inspection was completed. Somebody posed this question to me…could you please answer it? He sounds like a lawyer to me. We are all wondering what plant has Pilgrim’s 2010 dangerous old 2 stage SRVs in them? The rumor going on has it Pilgrim’s 2 stage SRVs have been borrowed from this Hope Creek’s SRV disaster? All three of the test 3 stage SRVs failed lift testing and 71% of their 2 stage failed also. Check out the date I wrote my blog entry. Would it make a difference to Pilgrim’s continued operation if they had Hope Creek 2 stage SRV in the plant? I like the concept of DG load testing. They test these guys monthly or so at full design load. They don’t test these guys at say 5% full plant design load. We got big quality troubles with both the 2 stage and 3 stage Target Rock safety relief salves. These failures are sending us a big signal something has to done about these problem. As most BWR plants during the worst case design accident…very infrequent…these Safety Relief Valves could/will have to be cycled up to 400 times. I don’t think the current testing regime covers this worst duty at all. How do we know how these delicate valves will behave after 100 cycle in a short period time and environment? We are talking science and engineering here? I’d be test cycling a hunk of these valves some 400 times…one valve 400 times per outage. This is how the engineers screw the operations people when the plant is in the clutches of a terrible designed accident…they don’t have our backs. Nope, seeing how important these guys are when 99% of the safety systems have been wiped off the table and unavailable, I be regularly test cycling these guys 800 times just to make sure something is working when everything else is gone. By the way, I got a great question for everyone. They say test stand lift or pressure testing damaged the internal just before going into the Pilgrim plant. Why hasn’t the damaged proliferated to the other BWR plants who also used this test stand or similar? Why haven’t I seen problems similar to Pilgrim’s throughout the industry whose use similar test stand set-ups, testing regimes or procedures? If I knew what plant those refurbish SRVs came from, then I could do an Adams look-up on the operational history of that model and the particular valves…to see how safe they are? This unnecessary secrecy implies a cover-up in itself. Why couldn’t they purchase high quality new valves? Why was Entergy’s Mrs. Burm so inaccurate when she said they were “new valves”. So they are refurbished valves. Did they come from Vermont Yankee? Why didn’t Energy just refurbish their old two stage 2010 valves to save money? Are the SRVs in the plant now identical to the pre 2010 ones? Cause if not, they needed a 10 CFR 50:59 and LAR. As you know, these valves could operate perfectly in another plant, but be inappropriate in Pilgrim. Remember most of our domestic fleet of nuclear plants are one-offs…each plant has a unique design. They did exactly the same test at the beginning of the last operating period with the 3 stage SRVs and nobody ever discovered at the test that three SRVs were nonfunctional and required an immediate emergency shutdown. It is what you get when you can’t insure the quality of the valve and its internals. Was the NRC observing this test too? There is increasingly widening gulf between what is documented in an “inspection report” and what really is going on in the plant. This is the story of the SRVs, Pilgrim and the NRC since 2010. So we are going to make believe Entergy never wrote this 2010 evaluation and the document isn’t in the docket? The valves that are in the plant right now! Are we to believe the NRC or Entergy? •	Entergy removed all four 3-stage SRVs and replaced them with refurbished 2-stage SRVs. •	The 2-stage SRVs are of a design that is in use at other industry boiling water reactors. •	The inspectors reviewed design documentation associated with this change. The inspectors determined that the modification and design of these 2-stage SRVs are consistent with Pilgrim’s design and licensing bases. •	The inspectors observed surveillance testing of the 2-stage SRVs during startup from the last refueling outage, and observed proper operation when actuated manually from the main control room. •	The inspectors concluded that the 2-stage SRV design did not invalidate any existing commitments or requirements. Based on our inspection, we determined that use of the 2-stage SRVs was acceptable. The NRC would be well advised to make NEW Decommissioning Rule Making a top priority, since as it is now, the Utilities can do just about what they want with little if any direction from the NRC since they will have access to the billions of dollars in decommissioning funds. SCE is now trying to purchase inferior casks for San Onofre Nuclear Waste despite the opposition from all those that live nearby that want them to purchase better quality casks. I request Pilgrim to shutdown on any indication of a leaking SRVs or any out of normal range temperature readings on a tailpiece. I request Pilgrim to shutdown quarterly in order to detect the highly possible outside setpoint lift plus or minus 3% required tech spec shutdown vulnerabilities and unreliabilities. The OIG was really was involved with this…I request a outside the OIG and NRC investigation of this whole mess. It all leads to this…I am asking the NRC now. Is the 2 stage SRVs now installed in Pilgrim safe? Does these valve meet all codes and rules…do they meet the highest ethical and nuclear professional obligations. Could you direct me to a current comprehensive engineering document discussing all the historic safety limitation in the currently installed 2 stage SRV valves and the compensatory action? Entergy’s LER: Notice how Entegy is allowed to pick and choose what information they release to the public. They aren’t required to explain the vulnerabilities of defective 2 stage SRVs design outlined in their 2010 LAR going into plant after the 2015 spring outage. This is a brazen cover-up on top of the first cover-up. It is mind boggling. Inspection Report 2015-002: Is this a full and accurate statement considering how defective and unsafe Entergy identified the 2 stage SRV in the 2010 LAR? Should the residents have discussed the limitation of the 2 stage SRVs in Inspection in Report 2015002? Should the NRC have forced Pilgrim to declare their “compensatory actions” for the defective and obsolete 2 stage SRVs outlined in the 2010 LAR now currently in the plant. I will below identify my proposed defective 2 stage SRV compensatory actions. This should be in effect until the 2 stage SRV valves are removed. They are used valves from another plant and Entergy has indicated this model valve is defective and dangerous in their 201O LAR. They certainly aren’t new. They basically grab them from a nuclear plant junk yard. They guy aren’t being manufactured today. A proper “licensee amendment request (LAR)” for the 2 stage SRVs currently in the plant would have addressed the reason why the obsolete SRVs are going back into in and the compensatory actions needs to run the plant with the knowingly defective SRVs. Honestly Mrs. Burm new valves? Seriously Mr. Modl, is this below statement a true and complete statement? Bill Mohl, president of Entergy Wholesale Commodities: “Mohl said that the plant has previously addressed the safety relief valve issue and the plant is operating safely”. Again the skimpy information gives Entergy the advantage to keep operating with the poorly designed and dangerous components. You notice both sides of the story; this is why Pilgrim needs to use the obsolete SRVs and this is the vulnerabilities of the design of the valve. You decide if it is safe or not. The NRC never treats us as adults with all information disclosed. A comprehensive report on the 2 stage SRV reliability and historic operability problem would have got all the problems on the table. Maybe Entergy could have put in a better model SRV? By the way, I am impressed with the NRC for allowing me to discuss problems like this on your blog. Am I the only one reading documents submitted by Entergy to the NRC anymore? Does the NRC keep up with reading pertinent documents like Pilgrims old 2010 SRV License Amendment Request (LAR). They are shifting from the 2 stage to the defective, unreliable and dangerous 3 stage SRVs. We now have these 2 stage SRVs back in Pilgrim.